REGINA - There's an aggressive skip leading Newfoundland and Labrador at the Tim Hortons Brier and, for the first time in years, it's not Brad Gushue. Rookie skip Greg Smith pushed veteran Jamie Koe of the Northwest Territories to his limit on Saturday in a 9-7 loss in the second draw of Canada's men's curling championship. Gushue, as the defending champ, is leading Team Canada this year. Koe's first Brier appearance was 2006 in Regina when Ken Peddigrew was at the helm for Newfoundland. Koe defeated Peddigrew 9-5 in nine ends. On Saturday night at the Brandt Centre, Koe was struck by Smith's ability to push the pace. "The guys held in, we kept (Chris) Shillie calm somehow and battled back and got some goods breaks down the end, but they played well the last four ends for sure,'' said Koe. Gushue led Team Canada past British Columbia's Sean Geall 10-2 in eight ends. He scored four in the sixth end and added two in the seventh for his first win of this year's tournament. Alternate Tom Sallows got a chance to try out the ice, replacing second Brett Gallant in the final end for Canada. Another team that surprised its opponent was Thomas Scoffin and his rink from Whitehorse. Although they fell 5-3 in nine ends, Yukon did not make it easy for Mike McEwen and Team Wild-Card. The ice was an issue for some teams on day one of the championship. Koe admitted his team battled with the ice in the first few ends. "It's not ice you want to draw against a couple,'' he said. 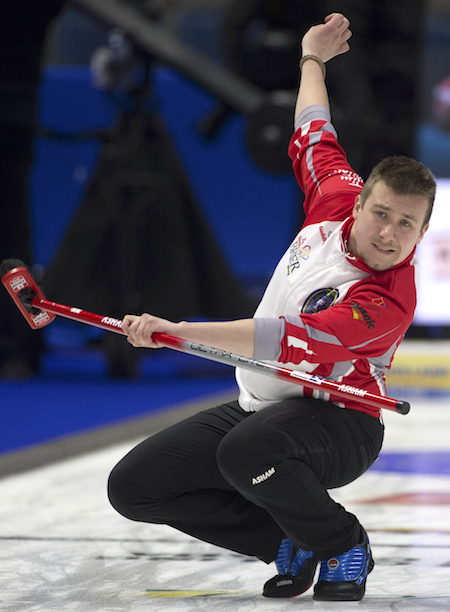 For the first-time Yukon Brier skip, it was a different story. Scoffin figured the ice out quickly, which helped them capitalize in a few ends against McEwen. "We're feeling good, so just keep building on the momentum and just make a few more shots next time and things could go our way,'' he said. It was an mostly even matchup between Alberta's Brendan Bottcher and Nova Scotia's James Murphy. Both skips made admirable shots when the pressure was on, but Murphy edged Bottcher 7-6 in 11 ends. In the day's early draw, hometown favourite Steve Laycock and his Saskatchewan rink fell to Quebec's Mike Fournier 5-2 in nine ends. Northern Ontario's Brad Jacobs topped Ontario's John Epping 4-3, despite the pressure from the Toronto-based rink. Top-seeded Reid Carruthers of Manitoba overcame some stressful situations from Prince Edward Island. But Eddie MacKenzie's team couldn't capitalize enough, dropping a 12-7 decision to Carruthers in eight ends. New Brunswick's James Grattan led for most of the game against Nunavut's Dave St. Louis, scoring deuces in the eighth and ninth end for a final score of 9-3. Anyone else notice all the empty seats??? Did they pull a “Pats” and charge too much for tickets??. ?